Women on a Mission: Mom Edition: THRIFTY CARDS! Yes, Cinco De Mayo is LONG GONE and that means I am one year older! (I don’t even want to think about that!) However, I have FAB friends and got some great gifts (Friends—the cards are on the way, I promise!). GREAT GIFTS REQUIRE A GREAT THANK YOU! 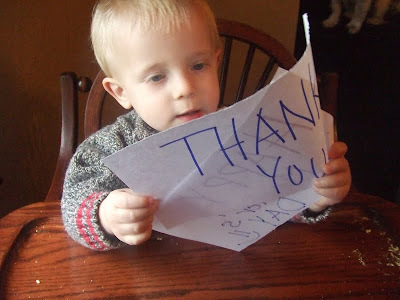 I try to send thank you cards, but it can be hard with crazy/busy lives—RIGHT WOMS? My mom always “made” me send thank you cards out after Christmas and I am grateful for the motivation! Thanks mom for teaching me the importance of saying thank you! And so, I needed an easy thrifty card. Mur-Man’s my go-to photo guy! A quick sign and voila—ready, set! I personally think it turned out adorable. Of course—you could get creative, you could get more personal. Have fun! I also, took a photo of Mur-Man for Mother’s Day! Grandparents love seeing their grandchildren! Much better than an impersonal card. And of course—THRIFTIER! You could even email the card versus sending it and save on postage! WOMS—do you have any other thrifty card ideas? Please share! PS: Steve took the photos and forgot to clean off the highchair pre-photo shoot! OOPS! 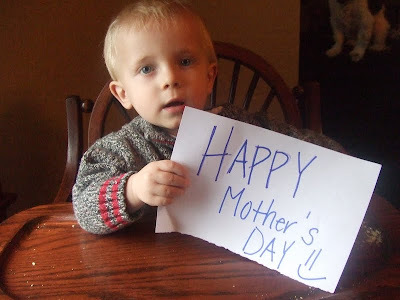 Loved the photo of your son with the Mother's Day message. It might have been nice to add the year to the message (don't you just hate the photos in an album that you can't date??) too. Great idea! I am totally going to do that next time. DECISION DONE!